I'm Roland Klinger of Germany and I run these pages together with many friends worldwide as a New Hebrides knowledgebase and for your enjoyment. And please remember: If the page is too wide for your screen - hit "CTRL" with "-". Hover or click the images! The Start Page : Welcome ! If you cannot find an information on these pages you are looking for please feel free to ask me, the webmaster. April 2019: and again a complete forgery of the "roast missionary". (on Ebay). A forgery of copy #2 on the roast missionary page here. Offered as shown. 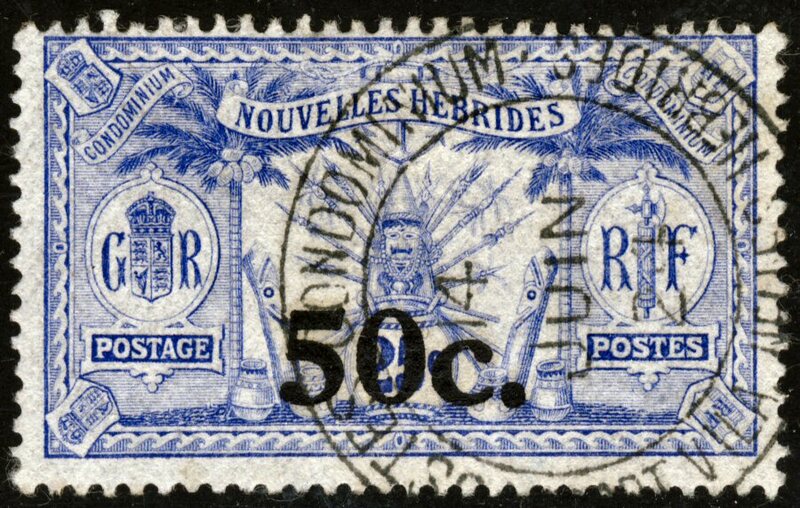 March 2019: and again a complete forgery including the "NEW HEBRIDES" ovprt. (on Ebay). 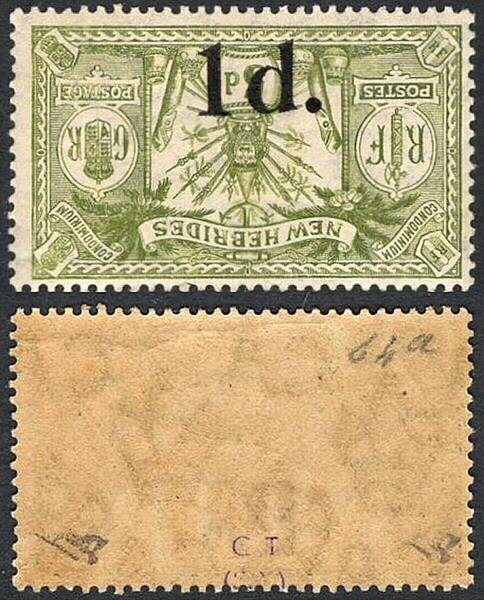 January 2019: a ridiculous forgery of Yv434a on Ebay - the left one is genuine. July 2018: a rather dangerous complete ovpt forgery of SG58a - the right one is genuine. Here's what I saw today on an international auction site: a 1921 inverted 1d overprint. 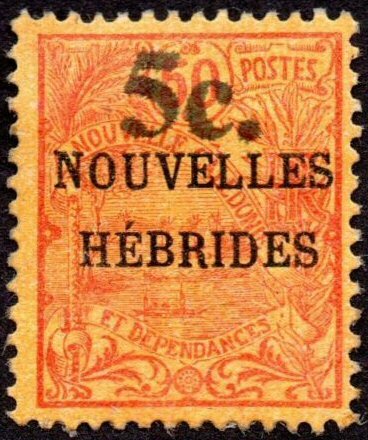 The "1d" is not identical to the genuine overprint and additionally is placed at the wrong side of the stamp: at bottom and not over the word "New Hebrides". I wonder if I get an answer from the seller when I asked him how it can be that the 20 known genuine stamps carry the overprint at another place. 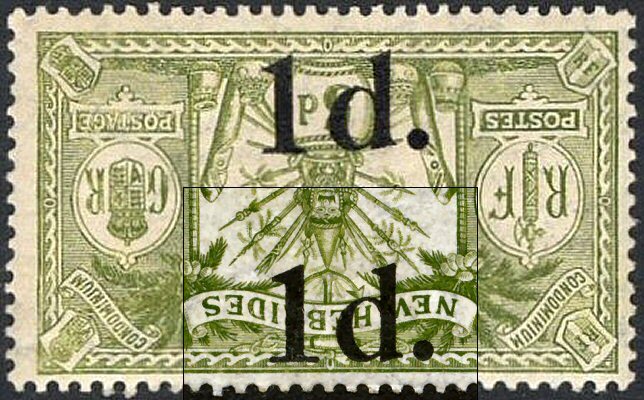 I inserted a part of a genuine stamp with 1d at the correct place into the forged one - beware! 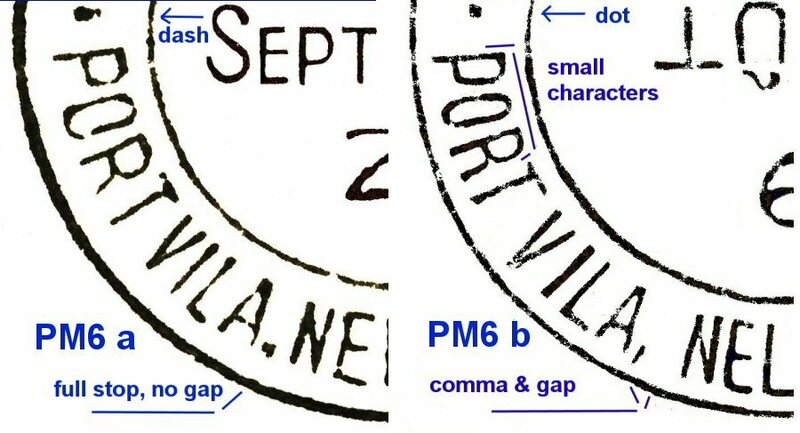 Some 1977 VILA overprint provisionals are on the market at the moment on an international internet auction site which are rather primitive forgeries. Beware! 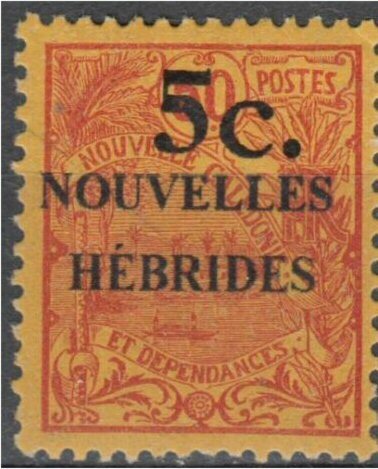 This is ridiculous: A very poor computer overprint of the 5c with the wrong printing ink and then "Nouvelles Hébrides N°58A N* TB cote 1350 euros ! !RRR" as a caption! Then way further down "Très RARE ,mais surcharge NON originale". 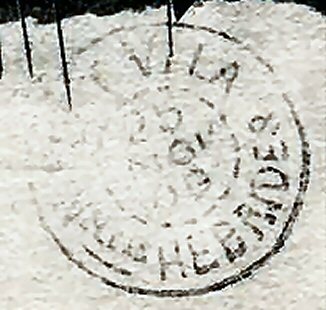 Beware of this forgery - this stamp had a value of some cents but now it is soiled with ink and is worth NOTHING. 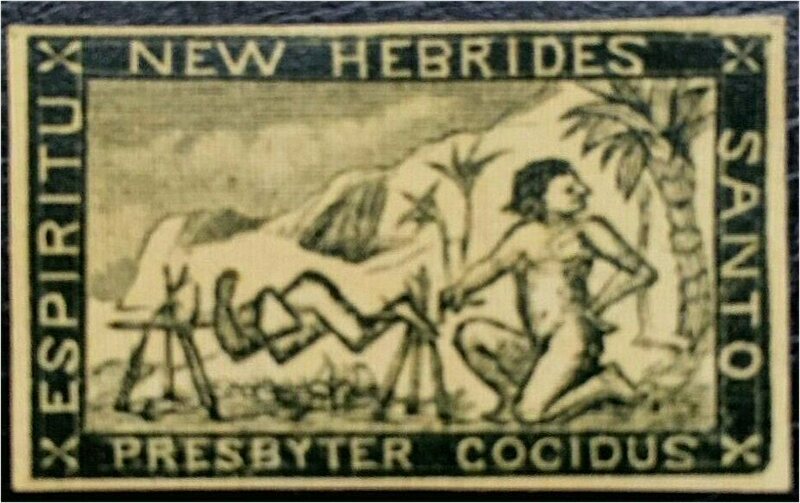 Beware of this forgery: At the moment (December 2014) a seller at Ebay U.S. offers a forgery made with an image of the roast missionary stamp auctioned at Feldman Switzerland in May for about 400 €. It is incredible that some people are willing to pay more than 1 Penny for a newly printed little piece of paper. 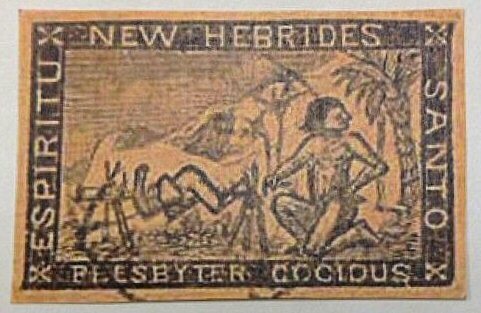 Beware of this forgery: At the moment (November 2013) a seller at Ebay U.S. offers forgeries of the roast missionary stamp. It is incredible that some people are willing to pay more than $US120 for a newly printed little piece of paper. The original is in my collection. 6 JUIN 24, 7 JUIN 24, 14 JUIN 24, 19 AOÛT 24 (date block inverted). You can read more here. Over one hundred years ago, on 29th October 1908, Postmaster Monsieur Roy finished his pain au chocolat and his café au lait, looked at his pocket watch and saw that it was 7.30am. Getting to his feet, he called to his young native assistant to go and open the doors. As he moved behind the counter, the first customer of the day, the young clerk from Burns Philp & Co. Ltd. walked up to the counter and presented a letter, addressed to a lawyer in Coffs Harbour, New South Wales. "a tuppenny stamp please", said the young clerk. "Ah, said M. Roy "This is a good day to ask for stamps my young friend. Today, we have for the very first time, the new stamps of the Condominium! Allow me to give you here two of the new one penny stamps. They are such a lovely shade of red.... Sacre! What is this? Some espèce d'imbéc ... I mean some fool in that damn printer in Suva has made a poor job here. Look, this whole row has not received the special overprint. I am most sorry. Allow me to give them to you for half price...."
Learn more in menu 1908 / 1908 Stamps / The 1908 Omitted Overprint. 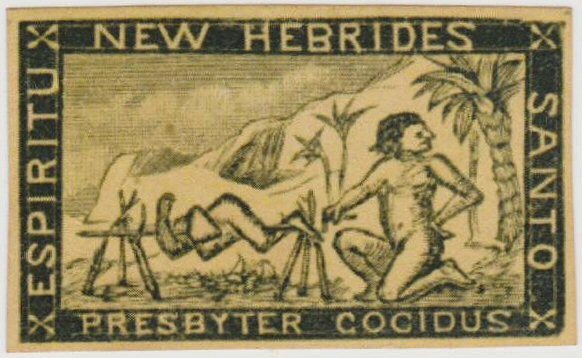 These web pages present the stamps and postal history of the New Hebrides as a "Internet Cover & Stamp Album". 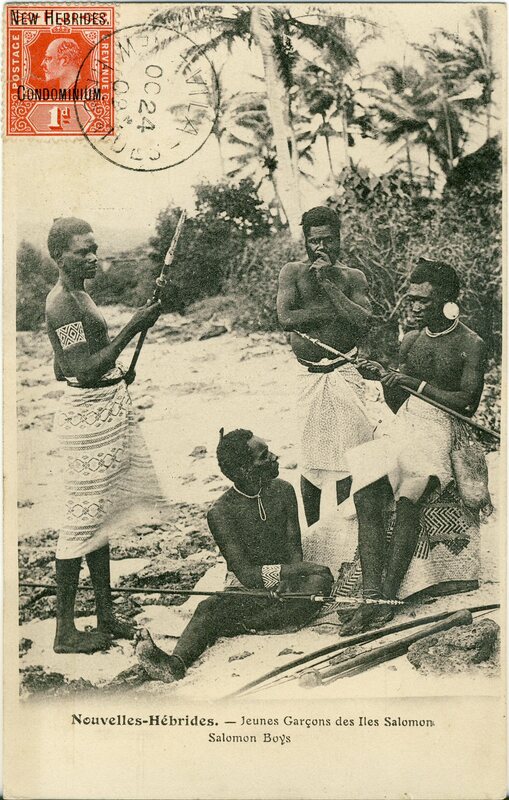 The main idea of this site is to share the knowledge and fascination of the stamps and postal history of the New Hebrides (today's name: Vanuatu) with other collectors. A few days after I started these pages in May 1999, Martin Treadwell contacted me and we decided to improve these pages together. Sheryll Ruecker joined us some months later. 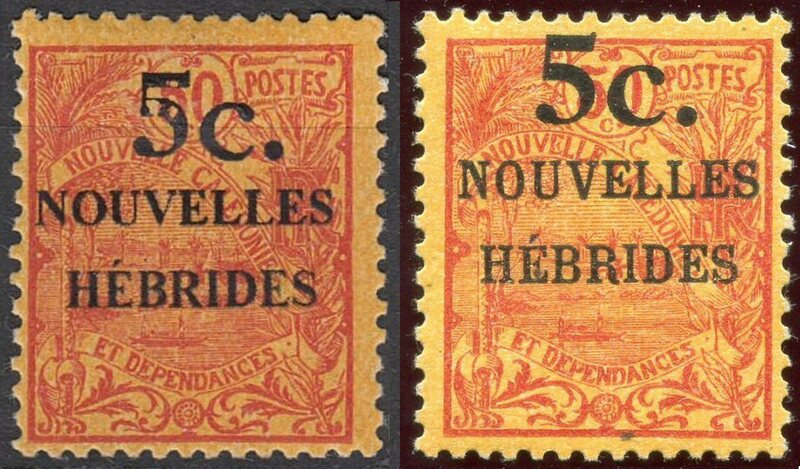 Hubert Goron (†), a collector of the New Hebrides for many years, contributed many important pieces of early postal history, as well as the highlight of the New Hebrides stamps, the first 1908 1d red vertical pair with missing overprint on this site. 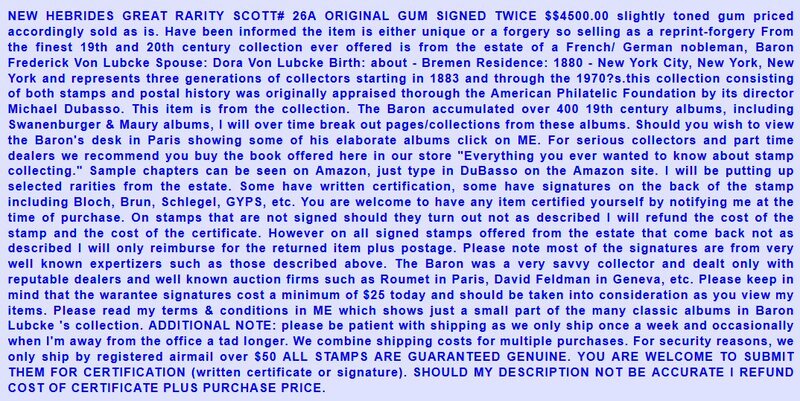 Later, Jacques Mérot (†) provided us with rare items such as 1907 essays, 1908 fakes, the scarce 1920 5c on 50c without CONDOMINIUM millésime, and 1977 varieties. 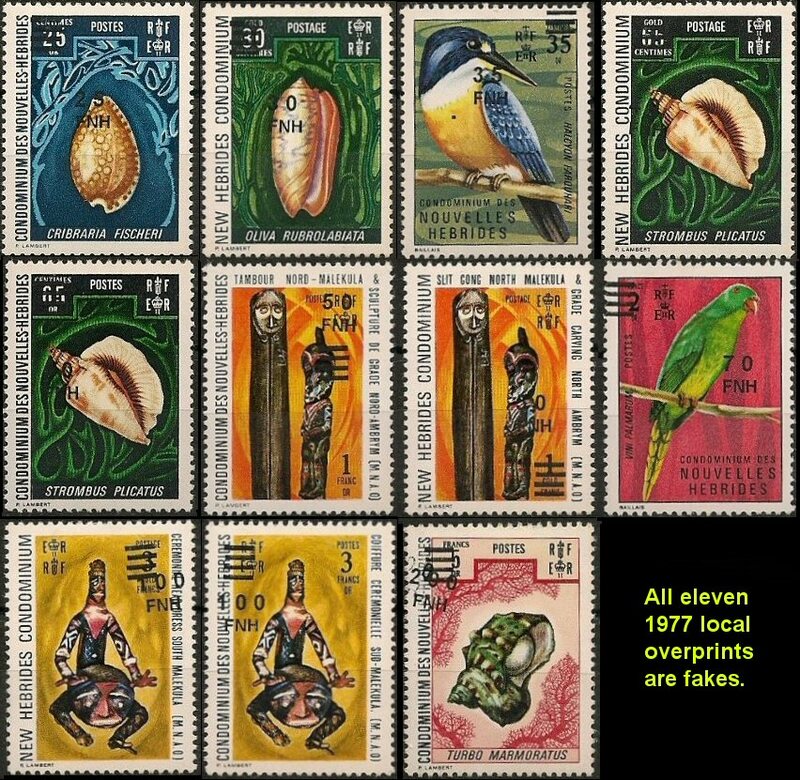 In the meanwhile all 1d missing overprints are shown here. A number of other contributors helped to improve these pages: Stan Jersey (†) and Dudley Priester (†) from USA, John Yeomans (†) and the "Mele", "Namba 2" (†) and "RMD" (†) collections from Great Britain, the "Aore" collection from Australia and many, many others contributed some superb examples of early postal history, and they also present some choice stamp items not found elsewhere. On some pages there are images of items originating from auctions and dealer's offers. In these cases the sources are named at the place were they are presented. Many thanks to them all for participating! 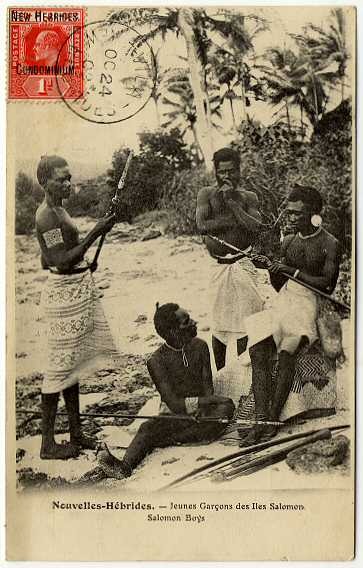 If you are interested in stamps of the Pacific Islands, you may want to link to the Pacific Islands Study Circle.